Love this necklace. I live at the beach so I like anything beachy! Artisan Yuu from Thailand handcrafted these darling necklace. The necklace features petite sea turtles with stone or shell inlay. In many cultures, the sea turtle symbolizes creation, strength, and good fortune. Crafted in sterling silver, the pendant hangs from an 18-inch chain that fastens with a spring ring clasp. Yuu is the younger sister of another featured artisan, Kung. Yuu started working in her sister's silver shop at young age and, with the help of her family, has opened her own jewelry shop. Just like Kung, Yuu uses sterling silver but incorporates other unique materials that enhance the design. Yuu loves the fusion of sterling silver with vibrant colors from gemstones and native sea shells. Yuu and Kung work together sharing ideas and inspirations. With the income from their jewelry shops, Yuu and Kung are able provide for their families and their local community. All weights and measurements are approximate and may vary slightly from the listed information. Treatment code N (abalone shell) D (reconstructed turquoise) D (reconstructed coral) N (mother of pearl). See Treatment Guide for further information. 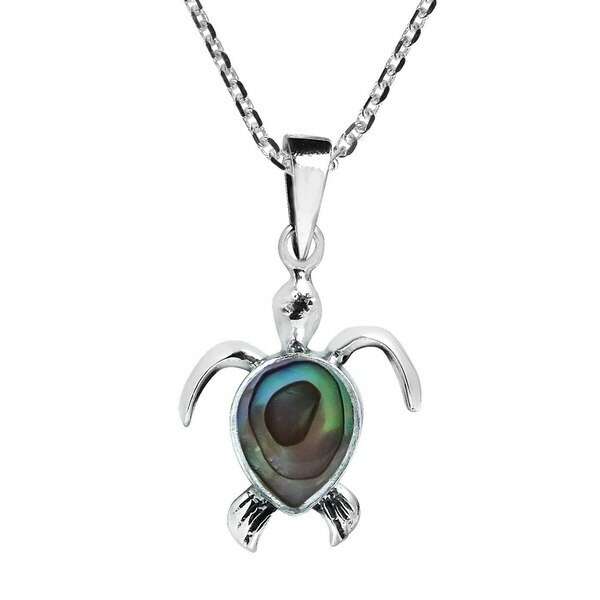 As a huge fan of sea turtles we absolutely love this necklace! Looks so attractive when wearing it, so pretty! Do not hesitate to purchase this item, you will be pleased. Pretty, dainty necklace for our daughter. This was shipped quickly and was packaged safely. Good starter piece of jewelry for a tween or teen! This worked out to be an excellent gift for my 4 year old daughter. My daughter saw this and fell in love! "Do you have stud earrings to match this necklace?" Unfortunately, we do not feature matching earrings within our inventory. Sterling Silver Italian 3.5mm Round Box Link Solid 925 Rhodium Necklace Chain 24" - 36"